was rather different from what I expected. Well, not that different as I was expecting a mystery set in the 1930s in Germany with a psychiatrist, an amnesiac lady, maybe a bit of history and science and possibly a murder. But Philip Sington delivers much, much more. The Einstein Girl brings history, science, war and the workings of the human heart together in a quiet, unassuming way which slowly unfolds and becomes a deep, sorrowful study of hope vs. reality. It’s beautifully written and slots you right into Weimar Germany and the shoes of lone psychiatrist Dr. Martin Kirsch. The story opens with the discovery of the naked body of a young woman by a lake. Miraculously she is alive, but cannot recall anything of her past. Dr. Martin Kirsch, an eminent psychiatrist about to get married to a beautiful socialite, finds himself drawn to this unnamed woman given the sobriquet The Einstein Girl by the press, for a flyer announcing Einstein’s lecture was found near her. As Kirsch begins to unravel her past, travelling to Zurich where she studied maths and physics and Slovakia where she grew up, he slowly finds his own past closing in on him as he slowly succumbs to his own demons. But the woman’s past is bigger and more complex than he thought. Is she an imposter involved in blackmail? What is her connection with Einstein? And can Einstein’s troubled son Eduard shed light upon the mystery? As Germany finds itself tumbling into an era of tight control and hidden agendas, Kirsch finds his control of his own life slipping away. It’s a little difficult to give a summary of this novel without giving anything away, so I’ll stop here. I confess I was a little startled that Einstein played such a big part in Sington’s novel. I was expecting just a cameo, but Sington doesn’t shy away from discussing the scientific problems which plagued Einstein’s later years prior to his move to Princeton, especially his work on the Grand Unified Theory in which he unsuccessfully tries to tie relativity and quantum mechanics together. Nor his muddy personal life with his first wife Mileva Marić. With the appearance of Mileva and their younger son Eduard in the story, Sington has obviously researched extensively into Einstein’s private life which surfaced in 1989 with the release of letters between the couple from before their marriage. I remember the uproar that followed with several prominent academics publishing books about Einstein’s personal life, his passionate love affair with Mileva and the fate of his daughter born out of wedlock. Up until then, he was untouched, the god of modern physics, and many of his colleagues and family tried hard to keep it that way. Although sometimes the scientific explanations reminded me of the history of science lectures I attended at college, Sington really knows his stuff but in no way does his writing try and show off that knowledge. In the end, I felt that Einstein’s scientific theories and his theories of life coalesced beautifully painting a picture of a real man. You may not admire Einstein as a husband or a father, but you cannot escape from the fact that he was a singularly gifted scientist. What Sington does beautifully is to weave a tale of the people he left behind. After finishing this book I started The Sun and Moon Corrupted by Philip Ball, another mystery with a hint of science and history which I was looking forward to reading, but I stopped after a chapter because compared to Sington, it just didn’t cut the mustard (shame because the title is beautiful). 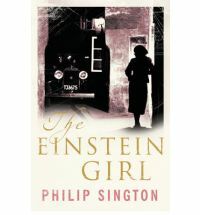 In The Einstein Girl, Sington really immerses the reader in the culture and events of the period; you can almost smell the restrained lives of the people living in a time of uncertainty. As you can probably tell, I was seriously impressed with this book. I read this for Nymeth’s 1930s Mini-Challenge and the Thriller and Suspense Challenge 2010! This sounds absolutely amazing! 1930’s Germany, great writing, AND history of science (a topic I find fascinating). To the wishlist it goes. My work is 1930’s Texas, not 1930’s Germany, but there is something ineffable in the air in this decade between the two wars. Nymeth: Yay! Your challenge is brilliant! Shelley: I know what you mean, it’s because you know that things will change irrevocably after WWII. This book sounds right up my street, so on the wishlist it goes. Thanks for the great review. Hello! I hope you enjoy it! I was waiting for your review and now I know this is definitely one I need to read. There was a recent HBO movie, Einstein and Eddington, that also touched on Einstein’s first wife (among other things). It was really good. I did my doctoral thesis on Eddington so I’m pretty obsessed about them and this period. I thought Einstein and Eddington was pretty good although there were some bits that weren’t accurate but it didn’t spoil my viewing pleasure at all – I think it’s pretty difficult to stick 100% to facts if you want to tell a good story (plus Eddington had all his personal papers burnt). So I was reading The Einstein Girl critically from a history of science point of view and was pretty impressed that he got this spot on. And I just really liked his writing style. I hope you like it too! This sounds excellent. I like that you touch on the way that he treats the scientific angles as it can be a tendency for authors to over explain science when it is a aspect of a novel (perhaps a little bit in McEwan’s Solar).